We’re now at the halfway stage of the Eurocup regular season and in Group A, there is quite a tussle going on. The away team are clear at the top with a 4-0 record, there is one team marooned at the bottom with a 0-4 record and the other three sides in Group A are stuck on a 2-2 record. The side from Zagreb are one of these teams with a 2-2 record and they’ll face a tough challenge this game. The two teams clashed in Round 1 of the Eurocup with the Spaniards winning by 101-76, and that win gave Gran Canaria a lead in the head to head series, by 2-3. This therefore is a chance for Zagreb to tie the head-to-head record and the record for this season, but it will be a tough task. However, Cedevita have been boosted by the purchase of John Shurna for the rest of the campaign. The key player for Cedevita is likely to be Miro Bilan as he has achieved an average of 14.5 points per game this season as well as offering up an average of 6 rebounds per game this campaign. 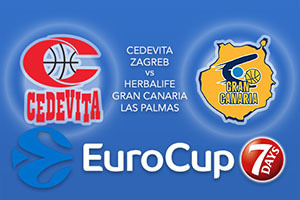 This is a difficult challenge for the Zagreb side but they’ll believe they can knock Gran Canaria off of their perch. Things have been going rather well for Gran Canaria so far this season and they’ll see no reason why they cannot continue their winning run of form. Kyle Kuric has impressed everyone with his return to European action after serious health concerns. He had a huge impact on the game when these two sides clashed earlier this season and he has averaged 19.3 points per game so far this season. Kuric has been a big reason in his team’s form to this point of the season. Pablo Aguilar has also been in fine form, offering an average of 11.8 points and 3.8 rebounds per game while Eulius Baez has offered an average of 11.5 points per game. The away team are the favourites for this clash and you should look to take Herbalife Gran Canaria Las Palmas at -5, which is available at odds of 1.90. With the Over/Under market for this Group A Eurocup game, look to go UNDER 171.5 which is provided at odds of 1.90. Bet Now!